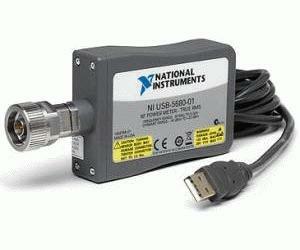 The National Instruments USB-5680 is a 6 GHz true RMS power meter that features high measurement accuracy and wide dynamic range packaged in a size similar to a typical power head. It is designed as a highly accurate instrument, offering better than ±0.18 dB of linearity across all frequency ranges and all power levels. As a true RMS power meter, the NI USB-5680 is ideal for measuring the power of continuous wave signals. This functionality, combined with a flexible API, makes it ideal for measuring path loss in automated test applications. In addition, its small size (less than 9.6 cubic in.) frees up valuable rack space without sacrificing performance. Traditional power meters feature a power sensor or head located close to the unit under test and connect via cable to an accurate A/D converter located in conventional instrumentation housing. Using the latest PC and A/D converter technologies, the USB-5680 combines both the sensor and the A/D converter in one package occupying less than 9.6 cubic inches – much smaller than the benchtop equivalent. The USB-5680 simply connects directly to an available USB port on any PC or PXI controller. To realize full instrumentation capabilities, the USB-5680 comes with a full-featured, executable soft front panel and intuitive, easy-to-use software libraries to help engineers quickly set up their systems. Engineers who need to measure continuous wave RF signals up to 6 GHz can use the USB-5680 in a stand-alone configuration with a VXI plug & play compatible executable soft front panel to facilitate interactive control.